Australia made 217-9 after choosing to bat and England lost its last wicket at 212 with three balls remaining. Clint McKay took three wickets, including a bizarre stumping to dismiss Ravi Bopara, as Australia beat England by five runs in the fifth one-day cricket international on Sunday to win the five-match series 4-1. Australia made 217-9 in its 50 overs after choosing to bat on a sluggish pitch at the Adelaide Oval and England lost its last wicket at 212 with three balls remaining in a match marking the Australia Day national holiday. England seemed to be coasting to victory when Joe Root made 55 and Eion Morgan 39 in a 64-run partnership for the foruth wicket that had it 154-4 in the 36th over. But it lost vital wickets quickly in a chaotic run chase and Bopara was left as its last specialist batsman and its last hope of ending the series with a win. Bopara saw a succession of partners come and go as England stumbled towards a winning total and did everything in his power to marshal the resources of the England tail. He was on 25 and seemed in command of an anxious situation when McKay, bowling at pace to wicketkeeper Matthew Wade, who was skillfully and courageously standing up to the stumps, beat his outside off. The ball struck Wade’s gloves, dislodged and fell forward onto the stumps just as Bopara lifted his back foot an inch above the ground. Australia appealed, more in hope than confidence, and the television umpire studied a long series of slow motion replays before deciding that Bopara’s foot had come up just as the bail had been removed. He was out and with him went England’s last chance of victory. His departure left England’s last pair at the crease, needing nine runs with eight balls remaining. Chris Jordan and James Tredwell reached the last over with eight runs still required and reduced the target with a single and a leg bye before Tredwell was caught by Wade off Shane Watson to end the innings. McKay finished with 3-36, including the wickets of Bopara, Ben Stokes (0) and Stuart Broad (7). 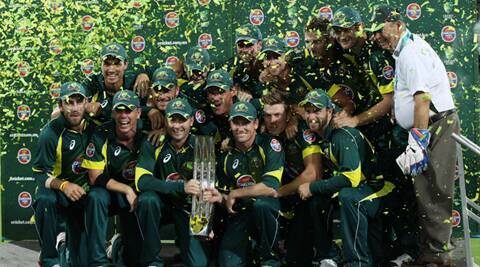 Nathan Coulter-Nile took 3-34 and James Faulkner 2-37 in an outstanding Australian bowling performance. “After we got the last wicket, that’s when I thought we had it won,” Australia captain Michael Clarke said. “A magnificent performance by the boys with the ball today. “I thought our batting was disappointing but I guess we had to have that belief we could still win the game. The execution through the powerplay and at the end … the boys did an outstanding job. Scoring runs on a holding Adelaide Oval surface required patience and perseverance that only a handful of batsman showed. George Bailey top-scored with 56 and Shaun Marsh made 36 in the Australian innings while Alastair Cook gave England a sound start with a careful 39. England’s run chase still seemed relatively undemanding but the only point at which they seemed in command was when Root and Morgan were together. What might have been a relatively comfortable conclusion to the match from England’s point of view became increasingly stressful, then hopeless as Morgan, Root and wicketkeeper Jos Buttler all threw away their wickets. All three fell to catches while trying to accelerate the scoring and while ignoring ample evidence that forced shots on a slow pitch were immensely dangerous. After hitting three fours and a six, Morgan drove a ball from Faulkner to Shane Watson at mid-off; Root seemed prepared to stay until then end but then played a blind, ramping shot and was caught by Xavier Doherty off Faulkner and Buttler pulled a ball from Coulter-Nile directly to McKay on the square leg boundary. Bopara and Tim Bresnan (13) nudged England a little close to victory before Bresnan was wastefully run out with 24 runs still needed. Broad was then bowled by McKay for 7, becoming the eighth man out with 14 runs required from 18 balls. “We should have got over the line there,” Cook said. “We got ourselves into some good positions. Credit to Australia, at the end they held their nerve better than we did but we didn’t help ourselves. There were some poor shots played under pressure. Earlier, Broad and Stokes shared six wickets as England restricted Australia to 217-9 in 50 overs. Broad bowled opener Aaron Finch (7) and Wade (31) and dismissed allrounder Watson for a duck to finish with 3-31 from 10 overs. Stokes removed March, Bailey for the innings’ top score of 56 and Glenn Maxwell for 22, severely denting Australia’s batting effort and finishing with 3-43. Bresnan bowled returning captain Clarke for 8 and Jordan claimed the late wickets of Faulkner for 27 and Coulter-Nile with consecutive deliveries in the last over but was denied a hat-trick by Doherty. Bailey’s 56, which included a half century from 60 balls, gave stability to a flimsy Australian innings. He put on 58 for the fifth wicket with Maxwell in the innings’ most productive partnership, helping Australia recover from 64-4. Bailey and Wade then put on 55 for the sixth wicket, lifting Australia to 167-6 in the 40th over but sound late bowling helped England regain the upper hand. After Bailey was out, Australia lost four wicket for 48 runs. Faulkner was later named man of the match for his outstanding bowling at the death and opener Finch was named man of the series.